The single most important success factor in securing discretionary grant funding is completing the necessary research and preparation. Grant-making organizations have different histories, requirements, and responsibilities. Therefore, it is critical to fully understand the goals of the grant awarding organization as well as the priorities of the grant program itself. This can be accomplished through careful analysis of the grant program in the CFDA, Grants.gov, the funding agency's website, the funding agency's Request for Initial Proposals (RFIP) or Request for Applications (RFA), and/or the grant guidance documentation. The original concept may need to be modified to meet the criteria of the grant program and the priorities of the grant awarding organization. In allocating funds, organizations base their decisions on how well the applicants proposed activities support the stated public purpose of the allocation. Begin by reading through the guidance in its entirety. Review the guidance again; paying close attention to the required submission elements (e.g., forms, and application sections). Develop an outline that includes all of the required submission elements. Review the evaluation criteria to ensure an understanding of the prioritized weight of each item/section. Review the applicant eligibility section to make sure your organization is eligible to apply. Begin to think of creative and innovative ways to justify planned projects or investments. Strategic Planning - Assesses the degree of risk a state's critical infrastructure, economy, and population face through threat, vulnerability, and possible consequences. Enhancement Planning (Gap Analysis) - Includes initiatives, programs, and projects based on the risks identified in the state strategic plan. Investment Justification - Provides the vision and design to justify funds for the programs and initiatives stated in the enhancement plan. The state applying for grant monies must be able to execute the plan effectively and state how achievement through enhanced planning and investment justification supports the expansion of preparedness. Check the milestones in your state's plan for grant allocation indicators. Flash Content "Recent disasters and changes in federal law have demonstrated a need to include the Food, Agriculture, and Veterinary Defense community in preparedness planning. This community needs to be proactive with ideas and the willingness to become engaged in exercises, drills, and planning meetings at the state level." Are there resources available to write the application? What is the likelihood you will win? Are resources available to execute the projects and manage the grant administratively? Are the planned projects one time investments or will there be maintenance/sustainment involved? If sustainment is needed, can your organization provide the sustainment resources or will future grants provide the funding for those resources? Are there any external obstacles or constraints? Can the project(s) be completed within the grant period of performance? How many groups of external and internal resources will there be? Typically the more there are, the greater the risk. Is this really a feasible project (e.g., completely eliminating all terrorist threats would not be a feasible undertaking)? 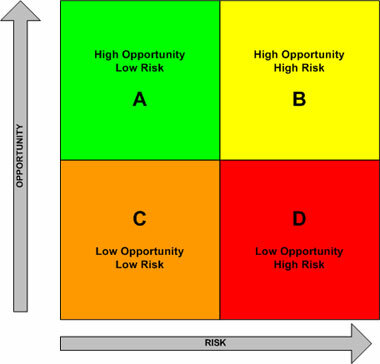 Once the opportunities and risks have been assessed, consider ranking the grant opportunity based upon the diagram below with "A" being the best use of resources and "D" being an opportunity your organization may not consider worthwhile. Flash Content Look carefully at the language in the grant scope and tie-in those words and phrases to your justification. For example, in order to apply for the DHS grants program, you must meet the requirements that are published each year in the grant guidance available on FEMA.gov. One requirement that has been in the grants guidance for a couple of years is that you must implement NIMS, the National Incident Management System processes, and post information on NIMSCAST, the NIMS Compliance Assistance Support Tool. Flash ContentThe guidance that we've had for the ag and food sector has been sparse at best. HSPD7 that came out in 2003 was one of the first things that we saw that really described the ag and food sector as one of the 18 elements of critical infrastructure. The following year, HSPD9 came out that gave more of a definition of the vision for the ag and food sector as it relates to homeland security. None of those had any funding attached to them and if you look at the success that states have or have not had across the country, it's by and large basically traced back to funding. Those states that have actually received adequate funding have had success; those that have received no funding have had little or no success in developing this new area of preparedness for the ag and food sector. I'm interested, where do I start? Choose this path if you’re new to the grant writing process and want to learn more about the types of funding available and how to locate grants that match your needs.Choose this path if you’re new to the grant writing process and want to learn more about the types of funding available and how to locate grants that match your needs. I’ve located potential grants, how do I evaluate applicability and apply? Choose this path if you have some grant programs in mind and want to learn more about evaluating which would work best for you and your organization, and also how to complete the application process. Choose this path if you are considering, or have already selected, a grant program to pursue and want to learn more about post-award management requirements.